Buongiorno! The sun is shining over the Adriatic Sea today and we are preparing to celebrate the summer season with a large food festival in Porto San Giorgio. You can walk for nearly a mile along the beach front to sample regional food from Le Marche. Each tent promotes their "sagra" (festival) for their community. In my family, we make a beeline for our favorites. For myself, it's the fresh mussels steamed in a huge cauldron with garlic and tomatoes. Michel searches out gnocchi and ragu. My youngest devours the tiny sweet clams that cling to spaghetti tangled in their juices. The teenager -- though not normally a sweet tooth -- heads to the end of the strip for cannoli, a specialty dessert. There is not a hamburger or hot dog to be found and as we head into one of America's greatest holidays, the 4th of July, I think of the past picnics and BBQ's. MIssing one of our American traditions, my Italian friends offered several potato salad recipes. 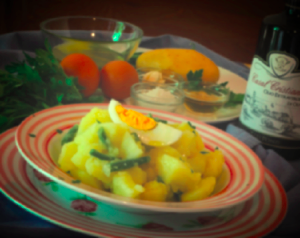 The potato salad recipe below was today's lunch made with our extra virgin olive oil from Casal Cristiana. It's deliciously easy to make and complements burgers, hot dogs, bbq ribs and chicken. A perfect way to celebrate America's independence! Enjoy! 1. For the potatoes -- Put a large pot of water over high heat to bring to a boil. Meanwhile, wash, peel and cut potatoes into bite size pieces, around one-inch cubes. Peel cloves of garlic but do not chop, leave whole, if you are going to include in the recipe. Once the water is boiling, put in potatoes and garlic. Boil for about 15 minutes or until cooked through. (Be sure to not overcook as the potatoes will continue to cook after draining.) Drain potatoes in a colander. Remove the garlic and discard. Let potatoes cool a bit before dressing. 2. Green beans -- Put a medium pot of water over high heat to bring to a boil. Meanwhile, trim the tops off and wash thoroughly. Once the water comes to a boil, toss in the green beans and cook for about 5 - 7 minutes. Do not over cook. Beans should still have a slight snap or crunch, not soft. When cooked, drain in a colander under cold water and cover with ice cubes, tossing, to prevent further cooking and to retain their bright green color. 3. Eggs -- Put a small pot of water of high heat, bring water to boil, place eggs in the water and cook for 5 - 7 minutes, then turn off heat. After about 10 - 15 minutes, rinse with cool water. Peel eggs. 4. Vinegar and Salt -- In a small bowl, put the vinegar and salt together so the salt will dissolve. Let it sit about 5 minutes.